For other uses, see John Jay (disambiguation). 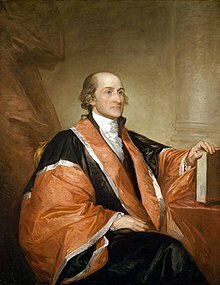 John Jay (December 23, 1745 – May 17, 1829) was an American statesman, Patriot, diplomat, one of the Founding Fathers of the United States, negotiator and signatory of the Treaty of Paris of 1783, second Governor of New York, and the first Chief Justice of the United States (1789–1795). He directed U.S. foreign policy for much of the 1780s and was an important leader of the Federalist Party after the ratification of the United States Constitution in 1788. Jay was born into a wealthy family of merchants and New York City government officials of French and Dutch descent. He became a lawyer and joined the New York Committee of Correspondence, organizing opposition to British policies in the time preceding the American Revolution. Jay was elected to the Second Continental Congress, and served as President of the Congress. From 1779 to 1782, Jay served as the ambassador to Spain; he persuaded Spain to provide financial aid to the fledgling United States. He also served as a negotiator of the Treaty of Paris, in which Britain recognized American independence. Following the end of the war, Jay served as Secretary of Foreign Affairs, directing United States foreign policy under the Articles of Confederation government. He also served as the first Secretary of State on an interim basis. A proponent of strong, centralized government, Jay worked to ratify the United States Constitution in New York in 1788. He was a co-author of The Federalist Papers along with Alexander Hamilton and James Madison, and wrote five of the 85 essays. After the establishment of the new federal government, Jay was appointed by President George Washington the first Chief Justice of the United States, serving from 1789 to 1795. The Jay Court experienced a light workload, deciding just four cases over six years. In 1794, while serving as Chief Justice, Jay negotiated the highly controversial Jay Treaty with Britain. Jay received a handful of electoral votes in three of the first four presidential elections, but never undertook a serious bid for the presidency. Jay served as the Governor of New York from 1795 to 1801. Long an opponent of slavery, he helped enact a law that provided for the gradual emancipation of slaves, and the institution of slavery was abolished in New York in Jay's lifetime. In the waning days of President John Adams's administration, Jay was confirmed by the Senate for another term as Chief Justice, but he declined the position and retired to his farm in Westchester County, New York. The Jays were a prominent merchant family in New York City, descended from Huguenots who had come to New York to escape religious persecution in France. In 1685 the Edict of Nantes had been revoked, thereby abolishing the rights of Protestants and confiscating their property. Among those affected was Jay's paternal grandfather, Augustus Jay. He moved from France with his sister Saint Jay to the Virginia Colonies and then New York, where he built a successful merchant empire. Jay's father, Peter Jay, born in New York City in 1704, became a wealthy trader in furs, wheat, timber, and other commodities. Jay's mother was Mary Van Cortlandt, who had married Peter Jay in 1728, in the Dutch Church. They had ten children together, seven of whom survived into adulthood. Mary's father, Jacobus Van Cortlandt, had been born in New Amsterdam in 1658. Cortlandt served on the New York Assembly, was twice mayor of New York City, and also held a variety of judicial and military offices. Two of his children (the other one being his son Frederick) married into the Jay family. In 1760, Jay attended King's College, which is now known as Columbia University, as an undergraduate. He entered college at the age of 14. During this time, Jay made many influential friends, including his closest, Robert Livingston, the son of a prominent New York aristocrat and Supreme Court justice. Jay took the same political stand as his father, a staunch Whig. In 1764 he graduated from King's College and became a law clerk for Benjamin Kissam (1728–1782), a prominent lawyer, politician, and sought-after instructor in the law. In addition to Jay, Kissam's students included Lindley Murray. Jay represented the conservative faction that was interested in protecting property rights and in preserving the rule of law, while resisting what it regarded as British violations of American rights. This faction feared the prospect of "mob rule". He believed the British tax measures were wrong and thought Americans were morally and legally justified in resisting them, but as a delegate to the First Continental Congress in 1774, Jay sided with those who wanted conciliation with Parliament. Events such as the burning of Norfolk, Virginia, by British troops in January 1776 pushed Jay to support independence. With the outbreak of the American Revolutionary War, he worked tirelessly for the revolutionary cause and acted to suppress the Loyalists. Jay evolved into first a moderate, and then an ardent Patriot, because he had decided that all the colonies' efforts at reconciliation with Britain were fruitless and that the struggle for independence, which became the American Revolution, was inevitable. On April 28, 1774, Jay married Sarah Van Brugh Livingston, eldest daughter of the New Jersey Governor William Livingston and his wife. At the time of the marriage, Sarah was seventeen years old and John was twenty-eight. Together they had six children: Peter Augustus, Susan, Maria, Ann, William and Sarah Louisa. She accompanied Jay to Spain and later was with him in Paris, where they and their children resided with Benjamin Franklin at Passy. Jay's brother-in-law Henry Brock Livingston was lost at sea through the disappearance of the Continental Navy ship Saratoga during the Revolutionary War. While in Paris, as a diplomat to France, Jay's father died. This event forced extra responsibility onto Jay. His brother and sister Peter and Anna, both blinded by smallpox in childhood, became his responsibility. His brother Augustus suffered from mental disabilities that required Jay to provide not only financial but emotional support. His brother Fredrick was in constant financial trouble, causing Jay additional stress. Meanwhile, his brother James was in direct opposition in the political arena, joining the loyalist faction of the New York State Senate at the outbreak of the Revolutionary War, which made him an embarrassment to Jay's family. Two of Jay's homes, both located in Westchester County, have been designated National Historic Landmarks. From the age of three months old until he attended Kings College in 1760, Jay was raised in Rye, on a farm acquired by his father Peter in 1745 that overlooked Long Island Sound. After negotiating the Treaty of Paris that ended the Revolutionary War, Jay returned to his childhood home to celebrate with his family and friends in July 1784. Jay inherited this property upon the death of his older brother Peter in 1813 after Jay had already established himself at Katonah. He conveyed the Rye property to his eldest son, Peter Augustus Jay, in 1822. This property remained in the Jay family through 1904. What remains of the original 400-acre (1.6 km2) property is a 23-acre (93,000 m2) parcel called the Jay Estate. In the center rises the 1838 Peter Augustus Jay House, built by Peter Augustus Jay over the footprint of his father's ancestral home, "The Locusts"; pieces of the original 18th century farmhouse were incorporated into the 19th century structure. Stewardship of the site and several of its buildings for educational use was entrusted in 1990 by the New York State Board of Regents to the Jay Heritage Center. In 2013, the non-profit Jay Heritage Center was also awarded stewardship and management of the site's landscape which includes a meadow and gardens. 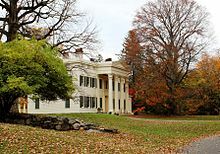 As an adult, Jay inherited land from his grandparents and built Bedford House, located near Katonah, New York where he moved in 1801 with his wife Sarah to pursue retirement. This property passed down to their younger son William Jay and his descendants. It was acquired by New York State in 1958 and named "The John Jay Homestead." Today this 62 acre park is preserved as the John Jay Homestead State Historic Site. Both homes in Rye and Katonah are open to the public for tours and programs. Every man of every color and description has a natural right to freedom. Jay took a more active leadership role to abolish slavery after 1777, when he drafted a state law to that purpose. It failed to gain passage, as did a second abolition law in 1785. Jay was "pushing at an open door"; every member of the New York legislature (but one) had voted for some form of emancipation in 1785, but they differed on what rights to give the free blacks afterward. Aaron Burr both supported this bill and introduced an amendment calling for immediate abolition. Numerous slaveholders independently freed their slaves after the Revolution, but thousands were held in New York City especially. Jay was the founder and president of the New York Manumission Society in 1785, which organized boycotts against newspapers and merchants involved in the slave trade, and provided legal counsel for free blacks claimed or kidnapped as slaves. The Society helped enact the 1799 law for gradual emancipation of slaves in New York, which Jay signed into law as governor. "An Act for the Gradual Abolition of Slavery" provided that, from July 4 of that year, all children born to slave parents would be free (subject to lengthy apprenticeships) and that slave exports would be prohibited. These same children would be required to serve the mother's owner until age 28 for males and age 25 for females, years beyond the typical period of indenture. The law thus defined a type of indentured servant while providing for eventual freedom for children born to slaves. It did not provide government payment of compensation to the owners. It also provided legal protection and assistance for free blacks kidnapped for the purposes of being sold into slavery. All slaves were emancipated by July 4, 1827. The process in New York may perhaps have been the largest total emancipation in North America between 1783 and 1861. In the close 1792 election, Jay's antislavery work was thought to hurt his election chances in upstate New York Dutch areas, where slavery was still practiced. In 1794, in the process of negotiating the Jay Treaty with the British, Jay angered many Southern slave-owners when he dropped their demands for compensation for slaves who had been freed and transported by the British to other areas after the Revolution. He had made a practice of buying slaves and freeing them as adults, after he judged their labors had been a reasonable return on their price. In 1798 he still owned eight slaves, the year before the emancipation act was passed. Jay was a member of the Church of England, and later of the Protestant Episcopal Church in America after the American Revolution. Since 1785, Jay had been a warden of Trinity Church, New York. As Congress's Secretary for Foreign Affairs, he supported the proposal after the Revolution that the Archbishop of Canterbury approve the ordination of bishops for the Episcopal Church in the United States. He argued unsuccessfully in the provincial convention for a prohibition against Catholics holding office. While considering New York's Constitution, Jay also suggested erecting "a wall of brass around the country for the exclusion of Catholics." Having established a reputation as a reasonable moderate in New York, Jay was elected to serve as delegate to the First and Second Continental Congresses which debated whether the colonies should declare independence. Jay was originally in favor of rapprochement. He helped write the Olive Branch Petition which urged the British government to reconcile with the colonies. As the necessity and inevitability of war became evident, Jay threw his support behind the revolution and the Declaration of Independence. Jay's views became more radical as events unfolded; he became an ardent separatist and attempted to move New York towards that cause. In 1774, at the close of the Continental Congress, Jay returned to New York. There he served on New York City's Committee of Sixty, where he attempted to enforce a non-importation agreement passed by the First Continental Congress. Jay was elected to the third New York Provincial Congress, where he drafted the Constitution of New York, 1777; his duties as a New York Congressman prevented him from voting on or signing the Declaration of Independence. Jay served on the committee to detect and defeat conspiracies, which monitored British Actions. New York's Provincial Congress elected Jay the Chief Justice of the New York Supreme Court of Judicature on May 8, 1777, which he served on for two years. Jay served as the second Secretary of Foreign Affairs from 1784 to 1789, when in September, Congress passed a law giving certain additional domestic responsibilities to the new Department and changing its name to the Department of State. Jay served as acting Secretary of State until March 22, 1790. Jay sought to establish a strong and durable American foreign policy: to seek the recognition of the young independent nation by powerful and established foreign European powers; to establish a stable American currency and credit supported at first by financial loans from European banks; to pay back America's creditors and to quickly pay off the country's heavy War-debt; to secure the infant nation's territorial boundaries under the most-advantageous terms possible and against possible incursions by the Indians, Spanish, the French and the English; to solve regional difficulties among the colonies themselves; to secure Newfoundland fishing rights; to establish a robust maritime trade for American goods with new economic trading partners; to protect American trading vessels against piracy; to preserve America's reputation at home and abroad; and to hold the country together politically under the fledgling Articles of Confederation. The Congress under the Articles of Confederation may make war, but are not empowered to raise men or money to carry it on—they may make peace, but without power to see the terms of it observed—they may form alliances, but without ability to comply with the stipulations on their part—they may enter into treaties of commerce, but without power to [e]nforce them at home or abroad ... —In short, they may consult, and deliberate, and recommend, and make requisitions, and they who please may regard them. Jay did not attend the Constitutional Convention but joined Hamilton and Madison in aggressively arguing in favor of the creation of a new and more powerful, centralized but balanced system of government. Writing under the shared pseudonym of "Publius," they articulated this vision in The Federalist Papers, a series of eighty-five articles written to persuade New York state convention members to ratify the proposed Constitution of the United States. Jay wrote the second, third, fourth, fifth, and sixty-fourth articles. All except the sixty-fourth concerned the "[d]angers from [f]oreign [f]orce and [i]nfluence"; the sixty-fourth touches upon this matter insofar as it treats the role of the Senate in making foreign treaties. In September 1789, George Washington offered him the position of Secretary of State (which, though technically a new position, would have continued Jay's service as Secretary of Foreign Affairs); he declined. Washington responded by offering him the new title—which Washington stated "must be regarded as the keystone of our political fabric"—as Chief Justice of the United States, which Jay accepted. Washington officially nominated Jay on September 24, 1789, the same day he signed the Judiciary Act of 1789 (which created the position of Chief Justice) into law. Jay was unanimously confirmed by the United States Senate on September 26, 1789; Washington signed and sealed Jay's commission the same day. Jay swore his oath of office on October 19, 1789. Washington also nominated John Rutledge, William Cushing, Robert Harrison, James Wilson, and John Blair Jr. as Associate Judges. Harrison declined the appointment, however, and Washington appointed James Iredell to fill the final seat on the Court. Jay would later serve with Thomas Johnson, who took Rutledge's seat, and William Paterson, who took Johnson's seat. While Chief Justice, Jay was elected a Fellow of the American Academy of Arts and Sciences in 1790. The Court's business through its first three years primarily involved the establishment of rules and procedure; reading of commissions and admission of attorneys to the bar; and the Justices' duties in "riding circuit," or presiding over cases in the circuit courts of the various federal judicial districts. No convention existed that precluded the involvement of Supreme Court Justices in political affairs, and Jay used his light workload as a Justice to freely participate in the business of Washington's administration. He used his circuit riding to spread word throughout the states of Washington's commitment to neutrality, then published reports of French minister Edmond-Charles Genet's campaign to win American support for France. However, Jay also established an early precedent for the Court's independence in 1790, when Treasury Secretary Alexander Hamilton wrote to Jay requesting the Court's endorsement of legislation that would assume the debts of the states. Jay replied that the Court's business was restricted to ruling on the constitutionality of cases being tried before it and refused to allow it to take a position either for or against the legislation. [T]he people are the sovereign of this country, and consequently ... fellow citizens and joint sovereigns cannot be degraded by appearing with each other in their own courts to have their controversies determined. The people have reason to prize and rejoice in such valuable privileges, and they ought not to forget that nothing but the free course of constitutional law and government can ensure the continuance and enjoyment of them. For the reasons before given, I am clearly of opinion that a State is suable by citizens of another State. The Court heard only four cases during Jay's Chief Justiceship. Its first case did not occur until early in the Court's third term, with West v. Barnes (1791). The Court had an early opportunity to establish the principle of judicial review in the United States with the case, which involved a Rhode Island state statute permitting the lodging of a debt payment in paper currency. Instead of grappling with the constitutionality of the law, however, the Court unanimously decided the case on procedural grounds, strictly interpreting statutory requirements. In Hayburn's Case (1792), the Jay Court made no decision other than to continue the case to a later date, and in the meantime Congress changed the law. The case was about whether a federal statute could require the courts to decide whether petitioning American Revolution veterans qualified for pensions, a non-judicial function. The Jay Court wrote a letter to President Washington to say that determining whether petitioners qualified was an "act ... not of a judicial nature," and that because the statute allowed the legislature and the executive branch to revise the court's ruling, the statute violated the separation of powers as dictated by the United States Constitution. In Chisholm v. Georgia (1793), the Jay Court had to answer the question: "Was the state of Georgia subject to the jurisdiction of the Supreme Court and the federal government?" In a 4–1 ruling (Iredell dissented and Rutledge did not participate), the Jay Court ruled in favor of two South Carolinan Loyalists who had had their land seized by Georgia. This ruling sparked debate, as it implied that old debts must be paid to Loyalists. The ruling was overturned when the Eleventh Amendment was ratified, as it ruled that the judiciary could not rule on cases where a state was being sued by a citizen of another state or foreign country. The case was brought again to the Supreme Court in Georgia v. Brailsford, and the Court reversed its decision. However, Jay's original Chisholm decision established that states were subject to judicial review. In Georgia v. Brailsford, the Court upheld jury instructions stating "you [jurors] have ... a right to take upon yourselves to ... determine the law as well as the fact in controversy." Jay noted for the jury the "good old rule, that on questions of fact, it is the province of the jury, on questions of law, it is the province of the court to decide," but this amounted to no more than a presumption that the judges were correct about the law. Ultimately, "both objects [the law and the facts] are lawfully within your power of decision." In 1792, Jay was the Federalist candidate for governor of New York, but he was defeated by Democratic-Republican George Clinton. Jay received more votes than George Clinton; but, on technicalities, the votes of Otsego, Tioga and Clinton counties were disqualified and, therefore, not counted, giving George Clinton a slight plurality. The State constitution said that the cast votes shall be delivered to the secretary of state "by the sheriff or his deputy"; but, for example, the Otsego County Sheriff's term had expired, so that legally, at the time of the election, the office of Sheriff was vacant and the votes could not be brought to the State capital. Clinton partisans in the State legislature, the State courts, and Federal offices were determined not to accept any argument that this would, in practice, violate the constitutional right to vote of the voters in these counties. Consequently, these votes were disqualified. Relations with Britain verged on war in 1794. British exports dominated the U.S. market, while American exports were blocked by British trade restrictions and tariffs. Britain still occupied northern forts that it had agreed to surrender in the Treaty of Paris. Britain's impressment of American sailors and seizure of naval and military supplies bound to enemy ports on neutral ships also created conflict. Madison proposed a trade war, "A direct system of commercial hostility with Great Britain," assuming that Britain was so weakened by its war with France that it would agree to American terms and not declare war. Washington rejected that policy and sent Jay as a special envoy to Great Britain to negotiate a new treaty; Jay remained Chief Justice. Washington had Alexander Hamilton write instructions for Jay that were to guide him in the negotiations. In March 1795, the resulting treaty, known as the Jay Treaty, was brought to Philadelphia. 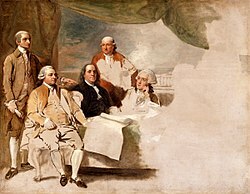 When Hamilton, in an attempt to maintain good relations, informed Britain that the United States would not join the Danish and Swedish governments to defend their neutral status, Jay lost most of his leverage. The treaty eliminated Britain's control of northwestern posts and granted the United States "most favored nation" status, and the U.S. agreed to restricted commercial access to the British West Indies. The treaty did not resolve American grievances about neutral shipping rights and impressment, and the Democratic-Republicans denounced it, but Jay, as Chief Justice, decided not to take part in the debates. The continued British impressment of American ships would lead, in part, to the War of 1812. The failure to get compensation for slaves taken by the British during the Revolution "was a major reason for the bitter Southern opposition". Jefferson and Madison, fearing a commercial alliance with aristocratic Britain might undercut republicanism, led the opposition. However, Washington put his prestige behind the treaty and Hamilton and the Federalists mobilized public opinion. The Senate ratified the treaty by a 20–10 vote (just enough to meet the two-thirds majority requirement). Democratic-Republicans were incensed at what they perceived as a betrayal of American interests, and Jay was denounced by protesters with such graffiti as "Damn John Jay! Damn everyone who won't damn John Jay!! Damn everyone that won't put lights in his windows and sit up all night damning John Jay!!!" One newspaper editor wrote, "John Jay, ah! the arch traitor – seize him, drown him, burn him, flay him alive." Jay himself quipped that he could travel at night from Boston to Philadelphia solely by the light of his burning effigies. As governor, he received a proposal from Hamilton to gerrymander New York for the presidential election of that year;[when?] he marked the letter "Proposing a measure for party purposes which it would not become me to adopt", and filed it without replying. President John Adams then renominated him to the Supreme Court; the Senate quickly confirmed him, but he declined, citing his own poor health and the court's lack of "the energy, weight and dignity which are essential to its affording due support to the national government." After Jay's rejection of the position, Adams successfully nominated John Marshall as Chief Justice. In 1801, Jay declined both the Federalist renomination for governor and a Senate-confirmed nomination to resume his former office as Chief Justice of the United States, retiring to the life of a farmer in Westchester County, New York. Soon after his retirement, his wife died. Jay remained in good health, continued to farm and, with one notable exception, stayed out of politics. In 1819, he wrote a letter condemning Missouri's bid for admission to the union as a slave state, saying that slavery "ought not to be introduced nor permitted in any of the new states". Midway through Jay's retirement in 1814, both he and his son Peter Augustus Jay were elected members of the American Antiquarian Society. Several geographical locations within his home state of New York were named for him, including the colonial Fort Jay on Governors Island and John Jay Park in Manhattan which was designed in part by his great, great granddaughter Mary Rutherfurd Jay. Other places named for him include the towns of Jay in Maine, New York, and Vermont; Jay County, Indiana. Mount John Jay, also known as Boundary Peak 18, a summit on the border between Alaska and British Columbia, Canada, is also named for him, as is Jay Peak in northern Vermont. On September 5, 1936, the Rye Post Office issued a special cancellation stamp in honor of their native son. To further commemorate the fact that Rye was Jay's hometown, the Rye Post office United States Post Office led by Congresswoman Caroline Love Goodwin O'Day commissioned painter Guy Pene du Bois to create a mural for the post office's lobby, titled John Jay at His Home. It was completed in 1938 during the WPA era. On December 12, 1958, the United States Postal Service released a 15¢ Liberty Issue postage stamp honoring Jay. High schools named after Jay are located in Brooklyn, NY, Cross River and Hopewell Junction, New York and San Antonio, Texas. Exceptional undergraduates at Columbia University are designated John Jay Scholars, and one of that university's undergraduate dormitories is known as John Jay Hall. In 1964, the City University of New York's College of Police Science was officially renamed the John Jay College of Criminal Justice. John Jay's childhood home in Rye, "The Locusts" was immortalized by novelist James Fenimore Cooper in his first successful novel The Spy; this book about counterespionage during the Revolutionary War was based on a tale that Jay told Cooper from his own experience as a spymaster in Westchester County. The Selected Papers of John Jay is an ongoing endeavor by scholars at Columbia University's Rare Book and Manuscript Library to organize, transcribe and publish a wide range of politically and culturally important letters authored by and written to Jay that demonstrate the depth and breadth of his contributions as a nation builder. More than 13,000 documents from over 75 university and historical collections have been compiled and photographed to date. John Jay is portrayed by Tim Moyer in the 1984 TV miniseries George Washington. In its 1986 sequel miniseries George Washington II: The Forging of a Nation he is portrayed by Nicholas Kepros. ^ Old Style: December 12. ^ a b Stahr, Walter (2006). John Jay: Founding Father. Continuum Publishing Group. pp. 1–5. ISBN 978-0-8264-1879-1. ^ a b c d e "A Brief Biography of John Jay". The Papers of John Jay. Columbia University. 2002. ^ Clary, Suzanne. From a Peppercorn to a Path Through History. Upper East Side Magazine, Weston Magazine Publishers, Issue 53, October 2014. ^ Cushman, Clare. The Supreme Court Justices: Illustrated Biographies, 1789–2012. The Supreme Court Historical Society, SAGE Publications, 2012. ^ "Jay, John (1745–1829)". World of Criminal Justice, Gale. Farmington: Gale, 2002. Credo Reference. Web. September 24, 2012. ^ "John Jay". www.ushistory.org. Retrieved August 21, 2008. 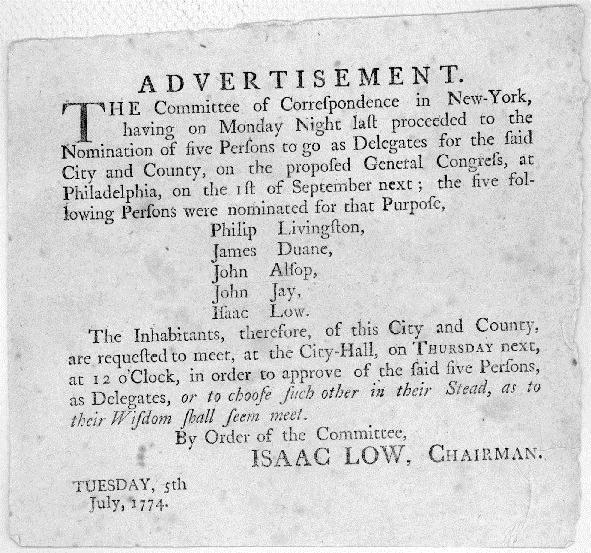 ^ "John Jay Nomination to the First Continental Congress". ^ "Urbanities: "The Education of John Jay"." City Journal. (Winter 2010): 15960 words. LexisNexis Academic. Web. Date Accessed: September 26, 2012. ^ One or more of the preceding sentences incorporates text from a publication now in the public domain: Jay, John (1892). "Jay, John" . In Wilson, J. G.; Fiske, J. Appletons' Cyclopædia of American Biography. New York: D. Appleton. ^ Du Bois, John Jay. "Jay Family Time Line". Retrieved February 21, 2015. ^ Morris, Richard. John Jay: The Winning of the Peace. New York: Harper & Row Publishers, 1980. ^ Wilcox, Arthur Russell. The Bar of Rye Township. The Knickerbocker Press, New York, 1918. ^ "News and Events: Pace Law School, New York Law School, located in New York 20 miles north of NY City. Environmental Law". www.pace.edu. Archived from the original on December 1, 2008. Retrieved August 22, 2008. ^ Jay Property Estate Restoration/Maintenance. Westchester County, New York, ACT-2012-173, Adopted November 26, 2012. ^ Cary, Bill. Jay gardens in Rye to get $1.5 million makeover. The Journal News (Westchester, New York), February 27, 2015. ^ "Friends of John Jay Homestead". www.johnjayhomestead.org. Retrieved August 24, 2008. ^ Jay, Jay (1774). "Address to the People of Great Britain". When a Nation, lead to greatness by the hand of Liberty, and possessed of all the Glory that heroism, munificence, and humanity can bestow, descends to the ungrateful task of forging chains for her friends and children, and instead of giving support to Freedom, turns advocate for Slavery and Oppression, there is reason to suspect she has either ceased to be virtuous, or been extremely negligent in the appointment of her Rulers. ^ Kornblith, Gary J. (2010). Slavery and Sectional Strife in the Early American Republic, 1776–1821. Rowman & Littlefield. ISBN 978-0742550964. ^ Gellman, David N. (2008). Emancipating New York: The Politics of Slavery and Freedom, 1777–1827. LSU Press. ISBN 978-0807134658. ^ "Timeline of Events Leading up to the Duel". The Duel. PBS. Retrieved August 25, 2008. ^ Sudderth, Jake (2002). "John Jay and Slavery". Columbia University. ^ a b Baird, James. 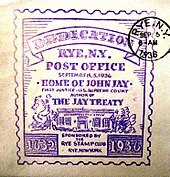 "The Jay Treaty". www.columbia.edu. Retrieved August 22, 2008. ^ a b Crippen II, Alan R. (2005). "John Jay: An American Wilberforce?". John Jay Institute. Retrieved December 13, 2006. ^ Kaminski, John P. (March 2002). "Religion and the Founding Fathers". Annotation: The Newsletter of the National Historic Publications and Records Commission. 30:1. ISSN 0160-8460. Archived from the original on March 27, 2008. Retrieved August 25, 2008. ^ Davis, Kenneth C. (2007-07-03). "Opinion | The Founding Immigrants". The New York Times. ISSN 0362-4331. Retrieved 2019-02-08. ^ "John Jay". WallBuilders. Retrieved May 12, 2013. ^ Jay, William (1833). The Life of John Jay: With Selections from His Correspondence and Miscellaneous Papers. New York: J. & J. Harper. p. 376. ISBN 978-0-8369-6858-3. Retrieved August 22, 2008. ^ Loconte, Joseph (September 26, 2005). "Why Religious Values Support American Values". The Heritage Foundation. Retrieved May 12, 2013. ^ a b c d e "Jay and New York". The Papers of John Jay. Columbia University. 2002. Retrieved August 23, 2008. ^ "The First Constitution, 1777". The Historical Society of the Courts of the State of New York. New York State Unified Court System. Retrieved August 23, 2008. ^ Newcomb, James (December 13, 2007). "Remembering John Jay, One of Our Founding Fathers". The John Birch Society. Archived from the original on September 20, 2008. Retrieved August 23, 2008. ^ "Portrait Gallery". The Historical Society of the Courts of the State of New York. New York State Unified Court System. Retrieved August 23, 2008. ^ Calvin C. Jillson; Rick K. Wilson (1994). Congressional Dynamics: Structure, Coordination, and Choice in the First American Congress, 1774–1789. Stanford University Press. p. 88. ISBN 9780804722933. ^ "John Jay". Independence Hall Association. Retrieved August 22, 2008. ^ a b c d "Treaty of Paris, 1783". U.S. Department of State. The Office of Electronic Information, Bureau of Public Affairs. Retrieved August 23, 2008. ^ "The Paris Peace Treaty of 1783". The University of Oklahoma College of Law. Archived from the original on September 29, 2008. ^ "What you should know about forgotten founding father John Jay". PBS Newshour. Retrieved August 25, 2017. ^ "Federalist Papers - Facts & Summary - HISTORY.com". HISTORY.com. Retrieved October 24, 2016. ^ "The Federalist 2 < The Complete Federalist Papers < 1786-1800 < Documents < American History From Revolution To Reconstruction and beyond". www.let.rug.nl. Retrieved October 25, 2016. ^ Becker, Carl (1920). "The Quarterly journal of the New York State Historical Association". 1: 2. ^ a b c "John Jay". Find Law. Retrieved August 25, 2008. ^ "Extract from an Address to the people of the state of New-York, on the subject of the federal Constitution". The Library of Congress. Retrieved August 23, 2008. ^ "The Federalist Papers". Primary Document in American History. The Library of Congress. Retrieved August 21, 2008. ^ "Federalist Papers Authored by John Jay". Foundingfathers.info. Retrieved August 21, 2008. ^ "The Supreme Court of the United States – History". United States Senate Committee on the Judiciary. Archived from the original on August 5, 2011. Retrieved October 18, 2011. ^ a b c d "The Jay Court ... 1789–1793". The Supreme Court Historical Society. Archived from the original on May 16, 2008. Retrieved August 21, 2008. ^ Lee Epstein, Jeffrey A. Segal, Harold J. Spaeth, and Thomas G. Walker, The Supreme Court Compendium 352 (3d ed. 2003). ^ "Thomas Johnson". Law Library – American Law and Legal Information. Retrieved August 22, 2008. ^ a b "Appointees Chart". The Supreme Court Historical Society. Archived from the original on April 21, 2008. Retrieved August 22, 2008. ^ "Book of Members, 1780–2010: Chapter J" (PDF). American Academy of Arts and Sciences. Retrieved July 28, 2014. ^ "Chisholm v. Georgia, 2 U. S. 419 (1793) (Court Opinion)". Justia & Oyez. Retrieved August 21, 2008. ^ a b "Hayburn's Case, 2 U. S. 409 (1792)". Justia and Oyez. Retrieved August 22, 2008. ^ Pushaw Jr., Robert J. (November 1998). "Book Review: Why the Supreme Court Never Gets Any "Dear John" Letters: Advisory Opinions in Historical Perspective: Most Humble Servants: The Advisory Role of Early Judges. By Stewart Jay". Georgetown Law Journal. Bnet. 87: 473. Retrieved September 24, 2013. ^ "Hayburn's Case". Novelguide.com. Retrieved August 22, 2008. ^ a b "Chisholm v. Georgia, 2 U.S. 419 (1793)". The Oyez Project. Retrieved August 21, 2008. ^ "Georgia v. Brailsford, Powell & Hopton, 3 U.S. 3 Dall. 1 1 (1794)". Oyez & Justia. Retrieved August 21, 2008. ^ "John Jay (1745–1829)". The Free Library. Farlex. Retrieved August 21, 2008. ^ Jenkins, John (1846). History of Political Parties in the State of New-York. Alden & Markham. Retrieved August 25, 2008. ^ Sullivan, Dr. James (1927). "The History of New York State". Lewis Historical Publishing Company. Archived from the original on June 10, 2008. Retrieved August 20, 2008. ^ a b c d "John Jay's Treaty, 1794–95". U.S. Department of State. The Office of Electronic Information, Bureau of Public Affairs. Retrieved August 25, 2008. ^ a b "Jay's Treaty". Archiving Early America. Retrieved August 25, 2008. ^ "Wars – War of 1812". USAhistory.com. ^ quoting Don Fehrenbacher, The Slaveholding Republic (2002) p. 93; Frederick A. Ogg, "Jay's Treaty and the Slavery Interests of the United States". Annual Report of the American Historical Association for the Year 1901 (1902) 1:275–86 in JSTOR. ^ Walter A. McDougall, Walter A. (1997). Promised Land, Crusader State: The American Encounter with the World Since 1776. Houghton Mifflin Books. p. 29. ISBN 978-0-395-90132-8. Retrieved August 22, 2008. ^ "Biographies of the Robes: John Jay". Supreme Court History: The Court and Democracy. pbs.org. Retrieved June 30, 2015. ^ Monaghan, pp. 419–21; Adair, Douglass; Marvin Harvey (April 1955). "Was Alexander Hamilton a Christian Statesman". The William and Mary Quarterly. Omohundro Institute of Early American History and Culture. 12 (3rd Ser., Vol. 12, No. 2, Alexander Hamilton: 1755–1804): 308–29. doi:10.2307/1920511. JSTOR 1920511. ^ Jay, John (November 17, 1819). "John Jay to Elias Boudinot". The Papers of John Jay. Columbia University. ^ "John Jay, Mount". BC Geographical Names. ^ "John Jay Commemorative Stamp". U.S. Stamp Gallery. Retrieved October 5, 2012. ^ Clary, Suzanne.James Fenimore Copper and Spies in Rye. My Rye, 2010. ^ Hicks, Paul. The Spymaster and the Author Archived April 2, 2015, at the Wayback Machine. The Rye Record, December 7, 2014. Bemis, Samuel F. (1923). Jay's Treaty: A Study in Commerce and Diplomacy. New York City: The Macmillan Company. ISBN 978-0-8371-8133-2. Brecher, Frank W. Securing American Independence: John Jay and the French Alliance. Praeger, 2003. 327 pp. Casto, William R. The Supreme Court in the Early Republic: The Chief Justiceships of John Jay and Oliver Ellsworth. U. of South Carolina Press, 1995. 267 pp. Kefer, Peter (2004). Charles Brockden Brown's Revolution and the Birth of American Gothic. Morris, Richard B. The Peacemakers: The Great Powers and American Independence 1965. Morris, Richard B. Witness at the Creation; Hamilton, Madison, Jay and the Constitution 1985. Perkins, Bradford. The First Rapprochement; England and the United States: 1795–1805 Philadelphia: University of Pennsylvania Press, 1955. Stahr, Walter (March 1, 2005). John Jay: Founding Father. New York & London: Continuum International Publishing Group. p. 482. ISBN 978-1-85285-444-7. Whitelock, William (1887). The Life and Times of John Jay. Statesman. p. 482. Morris, Richard B. ed. John Jay: The Making of a Revolutionary; Unpublished Papers, 1745–1780 1975. John Jay at the Biographical Directory of Federal Judges, a public domain publication of the Federal Judicial Center.